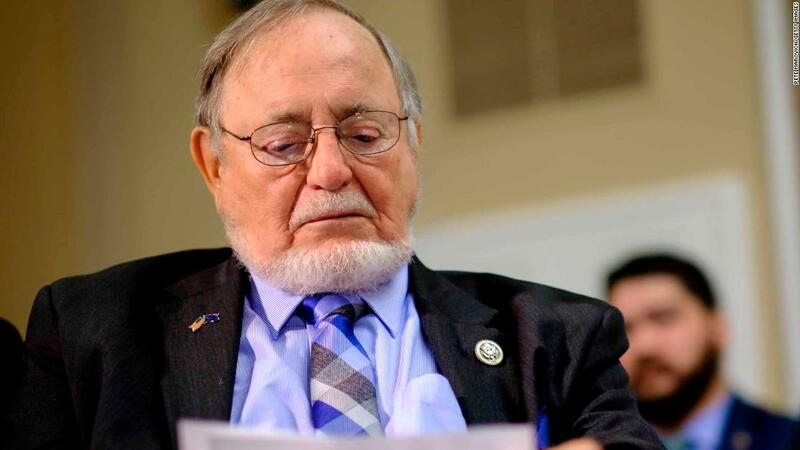 Rep. Don Young made the statement during an appearance last week in front of the Alaska Municipal League and while he was answering a question about what can be done to prevent gun violence in schools. Young, a Republican, argued that arming the teachers would help protect the students, then he gave examples of what he says when governments take firearms away from citizens. "How many millions of people were shot and killed for being unarmed – fifty million in Russia because their citizens were not armed," said Young. "How many Jews were put into the stoves because they were unarmed?" The video will be posted on the YouTube page of Dimitri Shein, a Democratic congressional candidate running against Young. Shein is also the man to be seen in Young's video interview. Shein posted the video on Twitter on Sunday and tagged several media outlets, including Anchors at CNN. In a statement to CNN, CNN said the congressman 's comment had been "taken out of context". Englisch: emagazine.credit-suisse.com/app/art … = 263 & lang = en. "He pointed out that Hitler was less able to defend himself in the seizure of firearms by Jewish Germans," said McCollough. "He did not hint that an armed Jewish population would have been able to prevent the horrors of the Holocaust, but its intended message is that disarming citizens can have harmful consequences, leaving a defenseless people at the mercy of its leaders." 19659005] It's not the first time a politician makes such an argument. In the run-up to the 2016 presidential election, Ben Carson sparked controversy by saying that the Holocaust would have been less deadly if more people were armed in Europe. "I think the likelihood that Hitler could achieve his goals" If people were armed, they would have lost a lot of weight, "he told CNN Wolf Blitzer in October 2015, when asked if the murder amounted to six million Jews would be prevented if there were no weapons laws in Germany. "I tell you, there is a reason why these dictatorial people take the weapons first," said Carson. The Anti-Defamation League, a Jewish civil rights organization has long resisted such opinions. "This historical reflection is deeply offensive to Jews, Holocaust survivors, and those who bravely fought Hitler during the Second World War. It is, in fact, as many historians have previously noted, a distortion of history itself, "ADL National Director Jonathan Greenblatt wrote in an online column in 2015.
" Weapons or lack thereof did not cause the Holocaust. The Holocaust was the product of anti-Semitism and the moral failure and indifference of the people. "